Selling for $30 0 0 Like this product? 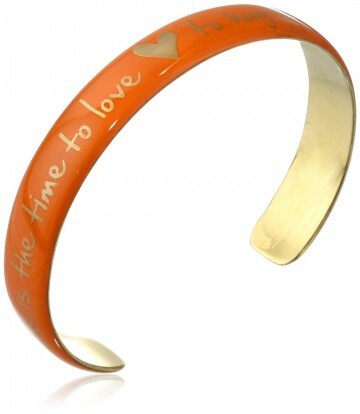 Sparkling gold-tone lettering is emblazoned on the façade of this Mercedes Salazar cuff, forming a message that reads, "Now is the time to love, to hug, to kiss." It's perfect gift to your special person. Mercedes Salazar was born on June 17, 1975 in Bogota DC, Colombia. She attended the Instituto Nacional de Bellas Artes’ Craftwork School in Mexico City (2000) where she received a degree as a jewelry designer. Her work is diverse, sophisticated, voluptuous, and always tries to show the two sides of the coin, the balance between lightness and weight, roundness and squareness. To her, opposites are fundamental. With incredible amounts of creativity and talent, Mercedes Salazar’s designs use traditional handcrafted techniques, VERSATILITY combined with the most unusual materials. These beautiful and unique pieces “will connect you to the Universe”, in the designer’s own words. Besides gold, silver, bronze, semiprecious stones, diamonds and emeralds, acrylic, glass, pearls, steel, aluminum, fabric and industrial materials can be found on the different pieces, creating an interesting contrast of light and color which Mercedes skillfully puts together thus creating a jewel that reflects all her love for existence and will never go unnoticed. Mercedes Salazar is a young woman who is attentive to what goes on around her and takes inspiration in the everyday life to turn those seconds and words into jewels. She spends the whole day with her artisans creating jewels, exploring and retrieving ancient techniques. Diverse, cheerful and defiant, she does not hesitate in breaking the rules with a profound conviction. The never-ending search for her own roots is the main nourishment of her spirit. Her lines are refined and subtle, and they reflect her admiration for hand-made jewelry. The Mercedes Salazar Jewelry Company was created seven years ago and its headquarters are located in Bogota, Colombia. This Colombian designer has exhibited her work at local fairs as Expoartesanias, and international trade shows such as ENK - Accesorie Circuit in New York City on its three annual versions, Première Classe Paris, SIMM Madrid and Democircuit Barcelona. Arco Iris Butterfly Sunburst Crystal Necklace and Earring Set. Eternal Love Teardrop Crystal Earrings Ocean Blue. Lovely Perfume for Women by Sarah Jessica Parker.